Nokia has just unveiled the latest offering in its Asha portfolio, the Asha 501. The Asha 501 borrows a few design clues from the much applauded N9 as it also does away with the front facing physical button in lure of swipe gestures. The Asha 501 also features a FASTLANE feature that gives you quick access to you recently used apps (it remains to be seen if this phone is capable of multitasking to some degree). 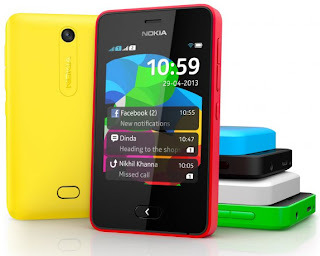 The Asha 501 borrows some design cues from the Nokia Lumia's Fabula design with highly saturated colours and sturdy body.The Asha 501 sports a 3inch QVGA (320X240) LCD Touchscreen display, 3.2 megapixel camera, Dual SIM connectivity, Wi-Fi, Bluetooth, 128MB internal memory with a free 4GB memory card, 1GHz processor, and a 1200mAh battery capable of standby times of: 48 days with a single SIM, 26 days with Dual SIM, and Talk time of up to 17 hours . The Asha 501 would cost $99 (5600 Rupees or 16000 Naira).